Want a miracle? Be a miracle! An Invitation to the Fertile-Peace-Maker in Each of Us. I was at the juice bar this morning. “You look so good!” I said to Kyla the friendly waitress behind the counter. I added a few more comments about the color of her dress and how well it suited her. “All this love-making so early in the morning,”said the elderly gentleman sitting at the nearby table. We have so many ways of making war; maybe we do have to expand the list of ways we make love. It’s been a while since my last blog. Life, teaching, writing, family — call for my presence, and I have to choose my priorities. So I’ve surrendered to the idea that this too, I’ll have to do in my way and in my own time. Return to the blog when it flags me down as it did today. You see today is a miracle of sorts for me. It’s the 11th of the month. That means, it’s the day I go and bow in a public place for my 9/11 Bowing Project. And today is also Holocaust Remembrance Day, the day that commemorates one of the most shameful chapters in human history. A chapter in my family’s history that has been central in shaping my life. This weekend I had the privilege to attend a series of lectures with a visiting German scholar, Thorsten Wagner. The series was dedicated to the journey of the German people to move from denial and willful oblivion toward a sincere attempt to come to terms with their Nazi past. The lectures of this remarkable young man were an extraordinary gift to me on so many levels. I also learned about one striking piece of history that was both devastating and a source of hope. Thorsten talked about the improvisational nature of the process that finally led to the murder of millions. Contrary to the popular belief that Hitler had a clear plan which was then gradually executed, Thorsten cited evidence that many of the pivotal events during Hitler’s rise to power, were initiated by grassroots groups. He talked about the “creativity” of the men in the field, who “learned by doing” and then proposed suggestions to their higher-ups on the most effective solutions to ridding Germany of the unwanted elements of Jews, Gypsies, Communists and homosexuals. So it’s not as though there was a “gang of demons” who forced the rest of the good citizens to perform unthinkable acts of cruelty. It was the harnessing of age-old hatred of “the Other” that was part of the collective consciousness that made the genocide possible. The theme of the roots of violence has been an obsession of mine, and Thorsten’s words were a validation of my own long-held feelings about the subject. Primarily, the idea that small groups of emotionally engaged individuals have immense power in charting the course of history. What has also been true for me, and was so beautifully validated by Thorsten this weekend, was that real healing, must also be initiated by people, rather than governments or academic institutions. I was awestruck by the images of the most moving, provocative memorials in Berlin, which are the physical expressions of the national soul-searching. So on this day of a personal miracle, when two of the memorials dear to me, fall on the same date, I’m extending an invitation to all of you. 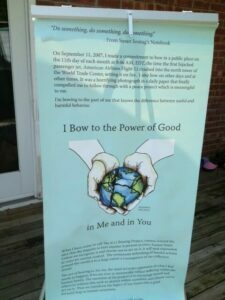 Here is what I propose: Originally one of the aspects of the 9/11 Bowing Projects was to declare September 11, the International Day of Compassion. But as it turned out, the day had already been claimed and named the Day of Service and Remembrance. Does that mean we need to give up? Our wisdom traditions teach that we are meant to turn curses into blessings. Why not “turn it around, from 9/11 to 11/9?. Why not declare 11/9 the International Day of Compassion? This post prompted an act of personal peacemaking with a family member, who I’ve had a very strained relationship over many years. I’ve done a lot of thinking about this relationship and even written to this person before, but this post motivated me to write again, which took a while. I wanted to be true to expressing my feelings and letting myself be heard, but I was also mindful to communicate in a non-violent way, no attacking or blaming, just how everything (that had happened) made me feel. A big part was also being ready to own up to my part in things, that I wasn’t just a “victim” of someone else’s behavior. There was something that needed my attention here. Needless to say, it took some time and patience with the orphans for that to happen. I also stopped running from the fact that this person is a part of my family, and by extension will be related to any child of mine that shows up (even if they never meet). So, for his or her sake, too, it’s important for me to come to a neutral place with this family member, on my side at least. Well, the letter was sent off. I don’t really expect a reply, but my heart is easier and I can think and talk about this person with more peace and compassion for her and for myself, and free up no small amount of mental and emotional energy in the process. Perhaps not a big deal in world affairs, but actually a huge deal in my world, so thank you, Julia. WOW, what thought and heart provoking posts!! I recently had a conversation with Julia during which she referenced a horrifying current event. I had to admit that I did not know the details and, although this set off a wave of orphan shame, it opened up a whole arena of feelings. It was beautiful and stunning. So, in response to Suzanne and Anna’s breathtaking comments, and as a way to birth a different relationship with the world, I am publically acknowledging that I have been avoiding the news for years and years. Talk about trying to work around orphans! I don’t just avoid myself, and risky people, I seem to have convinced myself that an ostrich approach to the terrible turmoil in our world will protect me. Contemplating this widens my perspective on how far reaching the “cowering” I mentioned earlier has been for me. I noticed that, when I first glanced at the topic of this thread, I felt fear and trembling. I wanted to turn away. I had to take a breath. I had to take several breaths. I was acutely aware of how long it took for responses to start to flow (who knows if that was any different from any other time, but it was on my radar) and I was in touch with the arduousness of getting this brave conversation going. I had strong feelings about not wanting Julia, or those of you courageous enough to enter in, to stand alone. For me to even stick my toe in this water is a radical move. Thank you all for this opportunity. Suzanne – hear hear! I so concur with what you are saying and you have said it so eloquently and brilliantly. I am starting now to recognise not just my own orphans that I have rejected/try to avoid rousing but the real life ones; yes those people I avoid because of the orphans that awaken in me when I am near them. We can also see this in our families, our communities, in wider society as a whole. Compassion can only grow if we start with ourselves but how brilliant to also see the bigger picture, what better motivation to continue with our own practice? So yes to an International Day of Compassion! I love your idea for a day of compassion to be acknowledged publicly.For me it is important that we all remember to engage in outward displays of compassion ,no matter what is happening for us inwardly. Sometimes it is too easy to be caught up with our own personal struggles and not acknowledge how much goodness and hope can evolve from connecting. Just like the phone circles provide me with a way of engaging, feeling compassion and learning from others I feel that your idea Julia for this International Day of Compassion would be hugely beneficial to each and every one person who takes part. I am FINALLY posting my comment on this blog – another beautiful entry Julia. I love the idea of an International Day of Compassion. As it turned out we didn’t have time to do the imagery exercise but just the naming of this awoke a spark of awareness in me. I became acutely aware of the times when I found myself thinking ‘if …..’ and it is almost always when a situation or person would trigger my rage. I want the situation not to occur or be different so that basically I will not have to feel my rage. The example I gave in the phone circle was ‘if my husband didn’t have such an all-consuming job that took up all his energy and left him burnt out then his sperm would be better and we wouldn’t have to go the ART route.’ I could clearly see that the ‘IF’ was just an escape route from my raging orphan. And the amazing thing has been that since then I have been full of curiosity whenever I find myself thinking ‘if …’. I choose not to go down the road of the ‘if’ thinking. Instead I take a few breaths and try to feel a little deeper whatever it is I am feeling. In that, there is also an acknowledgment (and path to acceptance) of the way things are in the present moment. As Julia has often remarked, it is not that we can’t tussle and feel rage about the way things are – but there is a difference between this and the ‘if’ thinking, which I see as a way of ducking out of the present and slamming the door to the orphanage. So the miracle for me is about showing up as fully as I can to the present moment; to the orphans calling out for attention. I have been given a lot of support from my UM & V in the past two weeks. A week after our phone circle I had a meeting with peers of a spiritual/psychological path I follow and it was all to do with how we react to certain situations and how we also avoid them. I realised that as well as the ‘if’ thinking/escape route, I also try to avoid situations that I know will trigger my raging orphans because I don’t want to hear them! Like choosing not to sit beside someone at the dinner table who I know will arouse some orphans from their slumber. Thing is, this is not life-enhancing and it also takes up a lot of energy to keep changing external circumstances to cut off my orphans. And I know in my heart there is a tonne of energy that comes from opening up to my orphans. World peace surely has to start with each and every one of us. Can we feel compassion for ourselves and be open to all parts of ourselves? Not just the parts we find easy to like – but really get muddy with all our beautiful orphans? It reminds me of a talk I was at once and someone said they had recently found the work of angels and could they not just keep doing that. The facilitator said ‘by all means you can do that, but if you are off with the angels, you’re not really living HERE, getting down and dirty with life.’ That really spoke to me because I know there is a lot of new-age stuff where you are supposed to somehow transcend or rise above (life/whatever) but this is not the path for me and what I love about FH is that you are not being asked to transcend anything but instead TRANSFORM it. As per Julia’s post. I keep sharing about FH wherever I go because my journey of not being able to conceive a child has been so enormously enriched by FH. And I can’t make people want to embrace it either and sometimes I find that difficult because I find it so amazing. But we all have our own path to follow. I feel incredibly lucky and blessed to have found Fertile Heart. I look forward to connecting with you all later on today. It all sounds great to me too! Count me in!!! An international day of compassion: we have international days of prayer and church unity, days dedicated to all sorts of remembrances, days set aside to mothers, fathers, grandparents and even the earth – but none yet for compassion? Seems rather odd now, doesn’t it? Such a day would be particulary fitting for those in the Fertile Heart Community – the more I heal through the OVUM techniques and imagry, the more compassion spills over from me to others. Healing opens up a space in us to accept the pain of those around us in a new and dynamic way. I’ve noticed it in my own life, and I’m sure that you have to. The process of healing and yearning for life opens us up in a new way to those around us. Isn’t this longing to create life amazing? Once it begins, it wants to grow and expand to encompass more than just ourselves and our longing for babies. Compassion toward ourselves and others transforms the very fabric of who we are and will become. Let us change together. As we do, let us watch this healing spread to those who are waiting for this compassion to come into their lives so that they see the dawn of hope even while they wait in the darkness of their pain. Yes, yes, yes to t-shirts, to turning curses into blessings, to standing up, to looking for opportunities, to allowing hope to be a leader and a motivator. I LOVE “loss into a lifeforce.” (If that is possible, then my miscarriages certainly are not in vain and they do not have to be denied in order to cope.) I feel my visionaries mobilizing as I read these posts. And that is such a gift since, when I started out, I had no sure sense that I even owned any visionaries. For me, it’s not just about looking to the positive for inspiration (although that’s good, very, very good) but also about finding a way to bear the dark forces without crippling fear, collapse, or withdrawal. My orphans easily duck and cover or run into hiding, feeling overwhelmed, helpless, small, and wishing they could live on another planet. I haven’t really wanted to go after them until now – it seemed preferable to turn away and let them cower in the shadows while pretending that the pain was off in the distance. This work is helping me find the courage to turn toward them and face all kinds of feelings. If I can take on the terror, dysphoria, and rage within, then I have hope of engaging in the world in a way that involves something other than cowering. What a wonderful idea this is! I love the idea of making it to a global day of compassion. I´m on. The title is strong and i like it, can´t get it out of my mind… Thank you Julia! Thank you for this posting. 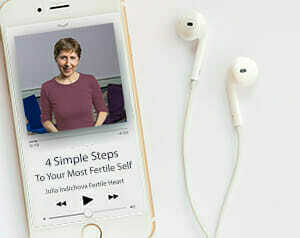 It relates directly to my fertility challenges within myself. I struggle to continue, participate and have faith that the work will produce a positive outcome. Recently I received results of my day two blood work (I haven’t checked my numbers since September of last year). In an effort to live in truth I thought it was time to see what was happening even though it might be painful. The results indicated the same medical issue, “poor ovarian reserve”. And I was told to remain hopeful and simultaneously realistic. It’s so interesting that this is the advice I received when it’s so hard for me to let these two co-exist in my life. I instantly choose realism and think I’m protecting myself from pain and failure. I know this way of thinking hasn’t served me well, in fact it works against my efforts. I’m trying so hard to keep moving in a positive direction. I think this posting is the perfect example of letting hope be the leader and motivator. Many small, grass-roots organizations wouldn’t exist without it. And it’s true that this hopeful motivation can be a powerful advocate for positive change. I’m working to keep this alive in my life. Such a thoughtful topic and so many heartfelt and wise posts to go along with it. Sounds like a great idea – Put me down for a t-shirt and I will see what I can do in my area or who knows maybe make it all the way to ground zero? I just realized I have been doing this work for almost a year now. When I started it all made sense, but putting it into practice proved to take time and patience. I have realized I am fertile and have opportunities for enhancing my fertility all around me every day. We are so hopeful a second baby will be another result of that fertility, but if it doesn’t happen I am not going to let that define the rest of my life. I am very interested in this idea of “turning the compassion around.” I would love to see it brought into a phone circle. I was born into a family full of tragedy and my whole life I have been struggling to find a way to love people who have caused me so much grief. I tried not speaking to them for over a decade but that didn’t help. I don’t exactly know the path I am going down but I know I have to find a place for my compassion among other feelings. I know feeling those things doesn’t mean I condone their actions but it allows me the full range of emotions which have been so cooped up for too long. Thank you for the very thoughtful post Julia. I like the call to action!! I think too often I have the best of intentions but somehow I don’t find the time. i just saw this same picture on my neighbors front door that was colored by her 3 year old daughter and it said “Take care of the Earth”. As a wise person once said take a look around you the signs and answers are everywhere! I truly believe that.. I have no doubt that taking action and standing up for this peace project would be a big step forward towards my baby. Great idea on the t-shirts and I will let you know if I think of something good..
difficult morning–birthing a few Visionaries today — and these comments are like a delicious snack I get to pack in my backpack as I head off on my daily travels. I love what you said about “turning it around” P. and Anna and love everyoone’s comments. I, too, am touched about the disctinction between obligation and genuine desire to give…the idea that we can’t demand genuine giving. I feel it with this work so clearly. People either will at some point find the Fertile Heart work “delicious” and thrilling and want to keep doing it and engaging with others because it “feeds a hunger” or it’s just not the right practice for them. And that of course is perfect. I do my yoga every day. A few poses. But it’s not my practice. It’s not where I go when I’m in conflict or wrestling with a difficult feeling. I don’t read the holy books of that tradition and of course it’a a beautiful ancient tradition, but it’s not the one I reach for at this stage of my life. 11/9 International Day of Compassion. Hmmm. needs something else… needs a clearer indication of what Turning it Around means, maybe something like: Loss into a Lifeforce? Any other suggestions? I’d love your input and then….I’m printing t-shirts and we can start with wearing them on both days. What do you think? Thank you all for your kind words. It certainly helps being part of this extended global community, I am learning so much from you all and I am very grateful for that. P – What you said really resonates with me, you’re right those words “why not turn it around” are key as is the acknowledgment of all our feelings. I have seen and felt first hand the terrible effects of the denial of our ‘negative’ or difficult emotions and yes you’re right it creates the biggest orphans of all, the ones who are so wounded they might seek to seriously wound another. Oh how I want to weave a blanket made of these comments and wrap it around me or, better yet, around all of us. For Julia, for Karen, for Stephanie, for Anna S., for Anna, for Caroline, for P, for those of you reading, and for those who will be touched by this process (which extends far and wide), I give thanks. My heart is with you, too, Anna. And I found Caroline’s distinction between heartfelt and dutiful kindness so lovely and so helpful for my orphans in hiding! I also welcome P’s words about accepting ALL feelings as a path to growth and vitality. You all have deeply affected my holy human loaf today. Thank you. The 5 words that caught my attention in your post are “Why not turn it around”. Knowing your work, I believe you did not only refer to the change of date from 9/11 to 11/9. I believe you also meant to turn around our understanding of compassion and peace. It seems to me that this type of celebrations, in every society perhaps, are often meant to applaud the good feelings and demonize the bad ones, with the risk of becoming even more anesthetized from our story, our needs, and our vitality. I am learning that the more I accept ALL of my feelings the more I am able to see the good in me and perhaps even in other people. I opposed those feelings for so long that they became enraged grown-up orphans. Should not this be the day of compassion towards this absurd need to purge ourselves of bad feelings and emotions? This is for me the core of your OVUM work and I hope it will continue growing with your peace-promoting efforts. I am happy to think about what I can do with my means. Julia, this idea sounds wonderful. I would have loved to join you in the US, but maybe we can organise something this side of the water too. I’d love to hear from anyone in northern Italy or thereabouts. Real, heartfelt kindness, the sort that comes from compassion and love (as against “dutiful” kindness that can often turn out to be the hiding place for a multitude of orphans): I don’t know if there could be anything more world-changing, or anything more joy-giving. And yet all too often we end up holding back for fear of making ourselves vulnerable, of being misunderstood or exposing ourselves to rejection (what, more orphans?). I am sure that where there is true compassion there cannot be war or hatred. Just yesterday during my imagery work my body asked me to “be the change”. What better way to do that than by being mindful and showing compassion to myself and those around me? This post gets straight to a very central point directly relating to fertility for me, it turns out that I still have quite a lot of peace that needs to be healed within my family. I recently miscarried and in the aftermath my relationship with my father was very very much highlighted as badly in need of healing despite my thinking things had got better. A very upset orphan turned up in full force and as inconvenient and unfair as I found her appearance on top of the grief and sadness of a miscarriage I realise that this must be my next step on the road to parenthood. So the fertile-peace-maker I would say is at the very heart of things. Peace, food, AND a workshop!? Are you kidding? What’s not to like!!? Your beautiful post, Julia, reminds me of the environmental slogan, “Think globally, Act locally,” a slogan I have always appreciated and taken comfort in. My orphans are terrified of standing out and horrified about not contributing enough – a rather paralzying bind. But not so random acts of peace may be just the antidote my UM and V have been looking for to soothe those orphans. And soothing orphans has got to be good for fertility. I wholeheartedly agree that mothering our shared planet and nurturing our human connections will help plant seeds both internal and external. Hurrah for that! In response to Robin’s loving and lovely ripple effect suggestion, I think the idea is captivating. I have a daughter and when she was of a pre-verbal age, I distinctly remember a complete stranger commenting to me in a Barnes and Noble bookstore restroom about my mothering efforts. She must have seen me struggling to wash the hands of my squirming toddler for, when I noticed that the wiggliness was due to a loose shoe and said something like “oh, that was what was bothering you,” she essentially thanked me for being kind. I will take that memory to my grave. I thought she was an angel. I will be forever grateful for her kindness. So, yes, lets go forth and throw our stones of peace in the pond and see what happens. It will be the most delicious kind of fun. I love it Julia! It’s scary to think that so many people need to hate other people to feel good about themselves. I love that you are challenging us to, as Karen said, to be the miracle that we want to receive from the universe. I will gladly join you on 9/11 for bowing and for the workshop. I also think that we can still call 9/11 The international Day of Compassion, even if the day also has other names. We can also propose it for another date as you said 11/9. I love that too. It would be great to organize a circle about this, or even to braistorm about it here. Can’t wait to hear what other people have to say.